IronYi........: One week after finishing my 1st Ironman! Some Olympians get the Olympics Rings tattooed on them. 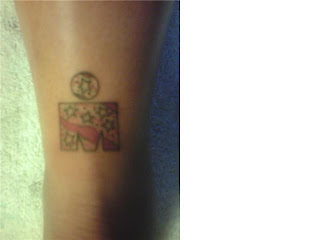 Some Ironman finishers get the M Dot tattoo! SURPRISE! Yes, my blog is sporting a new look! The dark purple has gone away with the finish of Ironman Louisville. the start of a new chapter is on it's way. Well, actually, I am just kind of bored and adjusting to this no weekend workout thing. As I sit here watching NFL Football, it's finally sunk in! Wow, I did an Ironman! I swam 2.4 miles. I biked 112 miles. I ran 26.2 miles. All of that in weather conditions which consisted of wind and a heat index of 101 degrees. Let's all remember that I grew up in San Francisco. Anything over 85 degrees and I think I might die from heat exhaustion! As I reflect on my day last Sunday, I realized that my bike time was really bad! Usually, my bike time is an hour longer in duration then my run time but at IML, it was 2 hours longer! My blood pressure was probably going through the roof with the heat on the bike! It's really amazing what my teammates and I have done and I am so proud of each and every single one of them! I've recovered quite well. By Wednesday morning, I was walking around without skipping a beat. Maybe it's all the hard training or maybe it was the compression tights or maybe the combination? Either way, I am liking the way I am feeling! I miss my team dearly though. Waking up on a weekend without having to look at the workout calendar is a little strange. So..some Olympians get the Olympics Rings tattooed on them. Some Ironman finishers get the M Dot logo tattooed on them so it's only fitting that yours truly get some ink done to honor this tremendous accomplishment! That's right! I did it..I got a M Dot tattoo. Not just any M dot tattoo though...I added a little flair with my own personal design with collaboration help from my tattoo artist at Black and Blue Tattoo, Victor. Like it? Like it? I do! I didn't think it would hurt too much since I just did the Ironman. Well, I was clearly wrong! Right above the achilles is still a sensitive place. Repeating to myself that I just did an Ironman only helped me so much in dealing with the pain. The stuffing head into pillow worked a heck of a lot better! So what's next for Ironyi? I go to Kona in October with my good friend Kara to be happy spectators at the Ironman Championships in Kona! We have a beach front condo rented on Ali'i Drive which should be amazing! In November, I have plans to backpack abroad for two weeks. Those who know me well know that I take off for 2-3 weeks to spend some alone time out of my element. Last year I traveled the Greek Islands, the year before I traveled Eastern Europe, the year before that, it was Spain and Portugal and the one before that, I traveled Italy and Prague. This year, because of our weak dollar, I chose Thailand! Although, there have been many warnings against traveling to that area of the government protesting going on there. I will be tracking it closely and may need to think of plan B..we'll see! I guess it wouldn't be a bad thing if I had to cancel my trip as I spent $$ on finisher's gear at Ironman! And after all that? I will be back on full training for Ironman Coeur d'Alene! You didn't think I was done after IM Louisville, did you? With my first season under my belt, I have learned lots and plan to apply that for next season. Also have a little redeeming to do in terms of Ironman finishes! I am continuing with Ironteam, it was a very hard decision and a decision I was unsure of but I am not ready to let go of this group of people yet so I am onboard once again. For 2009, I will not be a participant though, I will be on staff as a Community Captain, or at least that is what the rumor is. Thanks for being a part of my IM Louisville journey with me. Hope you stay on for my journey to Coeur d'Alene!